Download Handwriting keyboard from Google for Android. The best gift from Google this year. This is the best gift from Google this year, someone from Nairaland posted this. So far it has gotten pretty and nice comments from users who claim to be enjoying the app like mad. Here's a caption of what this app can offer! 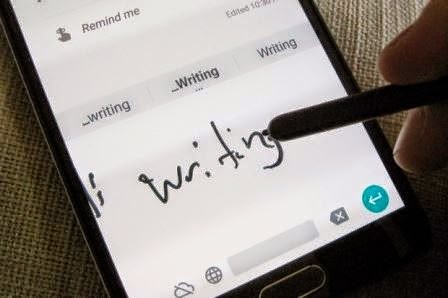 Google has introduced a new input keyboard that pose to simplify handwriting input on Android. The new Google Handwriting Input keyboard intelligently recognizes your scribble on the screen and converts it to text in your text box. It can also translate your writing to text in 82 different languages. Google says that the new keyboard app supports both cursive and print writing as well as suggesting a suitable emojis when you draw out a smiley face. You can download and set it as your default keyboard or as one of the input options on your Android device. Switching to it is easy if you are using the default Google Keyboard by touching the globe icon beside the spacebar. However, if you are using another keyboard app, you will have to select it from the list of your installed keyboard to use it. Download this handwriting app here or from PlayStore.